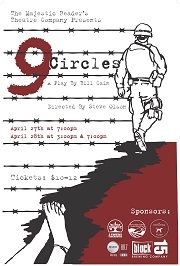 A psychological thriller based on actual events, 9 CIRCLES tells the story of an American soldier on trial for his life. The young soldier—honorably discharged but then accused of an unspeakable war crime in Iraq—Daniel Reeves is forced to navigate a Dantesque labyrinth of commanding officers, public defenders, lawyers, preachers and military psychiatrists. By turns shocking, mesmerizing and bitingly funny, 9 CIRCLES accompanies this astonishing young soldier on a tour de force journey to a shattering conclusion in which the infinite size and tremendous power of a young man's soul is revealed. $10 Everyone for Opening Night Special! James Lapine and Stephen Sondheim take everyone's favorite storybook characters and bring them together for a timeless, yet relevant, piece... and a rare modern classic. The Tony Award-winning book and score are both enchanting and touching. The story follows a Baker and his wife, who wish to have a child; Cinderella, who wishes to attend the King's Festival; and Jack, who wishes his cow would give milk. When the Baker and his wife learn that they cannot have a child because of a Witch's curse, the two set off on a journey to break the curse. Everyone's wish is granted, but the consequences of their actions return to haunt them later with disastrous results. 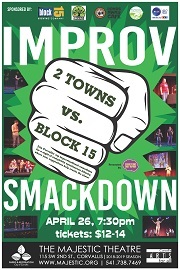 Looking to play some fun improv games, but nowhere to play and no one to play with? NOT ANYMORE! 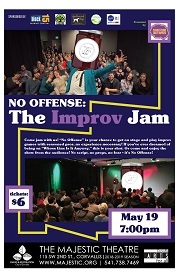 “No Offense: The Improv Jam” is a fun-filled evening of made-up comedy where anyone in the audience can volunteer to play games on stage! If you’ve ever dreamed of being a player on “Whose Line Is It Anyway,” this is your chance – no experience necessary! Or if you’d rather stay in the audience and watch, that’s great too – come to play or to cheer on your friends! No script, no props, no fear – No Offense! When displaced New York director Miriam Bloom finds herself in Kingdom City, Missouri, she reluctantly agrees to direct a high school production of The Crucible. As the play unlocks the students’ dark secrets, a local youth minister threatens to cancel the play, creating a firestorm in this small conservative town. Inspired by actual events that occurred in 2006, KINGDOM CITY strives to present an even-handed examination of the fears and concerns that arise when the welfare of children is at stake. 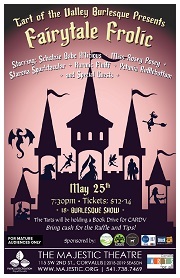 Enter a world of fairytales and magic with Tart of the Valley Burlesque. This romp through magical lands will bring beloved characters to life like you've never seen before. 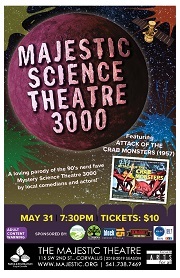 Our loving (and legal) parody of the 90s nerd fave “Mystery Science Theatre 3000” our local improv-ers and actors will be cynically disemboweling golden age science fiction films and PSAs no matter how loud you scream, “Down in front!” See it live, loud, and weeeeeeird at The Majestic! So come join our intrepid crew on this scientastic adventure, complete with PSA’s and made more palatable with brews from our sponsors 2 Towns Ciderhouse and Block 15. Joel Kim Booster has the energy of a person desperately trying to escape something. Namely, the Midwest. Adopted from South Korea by white evangelical Christians, Joel was raised in the suburbs of Chicago where he “knew I was gay before I knew I was Asian.” Now based in Los Angeles, he has performed on Conan, had his own Comedy Central special, appeared in the Chris Rock/Adam Sandler movie The Week Of, and been a writer for Billy on the Street and Big Mouth. In 2018 he was named one of Variety’s 10 Comics To Watch, as well as one of Forbes’ 30 Under 30 in Entertainment. 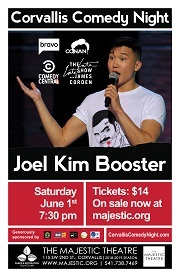 Joel Kim Booster is one of the fall-down-funniest stand-ups working today and we can’t wait to kick off Pride Month with him here in Corvallis. The Arc Benton’s “Drama Squad!” will present its new play, “The Snowmaiden: a Tale of Old Russia” this June in the Lab Theatre at the Majestic. Due to the fast sellout of tickets for our previous production of “The Dancing Princesses”, we’ve added another performance. 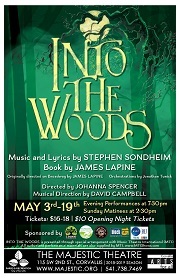 Shows will be on Friday, June 7th at 7:00pm and on Saturday the 8th and Sunday the 9th at 3:00pm. In the far north of Russia, 300 years ago, two poor peasants, Maksim and Natalya, long for a child. The mysterious Baba Yaga creates a child out of snow for them but warns that they must always love her, or she will melt away in the Spring. Little Snegurochka charms the entire village but also encounters the Wolf and Fox as events lead her away from the only home she has ever known. This new play explores the love that binds families together and is appropriate for all ages. Kate & The Crocodiles: Kate Morrison, a refreshing and innovative classically-trained vocalist, recently performing as a guest vocalist with Pink Martini, and the Utah Symphony; Craig Bidondo, a colorful, energetic and soulful keyboardist; Gavin Bondy, the intuitive trumpeter of Pink Martini, and Brent Follis, a truly world-class drummer. The Portland-based quartet present stunning indie rock originals and covers, early jazz and jazz standards, reinventions of ‘70s and ’80s rock as ballads, classical art songs mixed with rock (yes, really), and other surprises from far and wide. If the spectrum sounds broad, it is all held together by a signature sound informed by classical training and a respectful blending of many genres. It’s like a warm conversation with a good friend—and at times, it’s like world-class music meets stand-up comedy because these fun four have what may be considered almost too much fun performing together. An evening with Kate & The Crocodiles has been called musical, intimate and unforgettable. The Improv at the Majestic goofballs are back again with another installment of "No Class," the role playing game-inspired improv show. Modern Dance Technique will present its 28th Annual Spring Celebration of Dance on June 14 and 15 at 7:30 pm. The repertoire contains 12 new dances and reflects the technique developed over 27 years at MDT. The works are energetic, thought provoking, and entertaining; combining classic modern with innovative contemporary movement. The wide range of mood, music, and movement allows for the artistry of the strong, talented and dedicated MDT dancers to soar! Get ready to be stunned, hunniez! 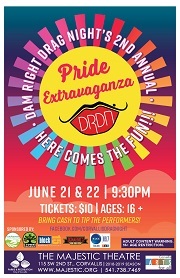 Join the Dam Right Drag Night crew for a night full of gag-worthy performances from some of the Willamette Valley's fiercest performers in celebration of Pride Month. This show is open to all folks ages 16 and up. Discovered in a treasure-filled parking lot in Leicester, England (next to a pile of bones that didn’t look that important), an ancient manuscript proves to be the long-lost first play written by none other than seventeen-year-old William Shakespeare from Stratford. WILLIAM SHAKESPEARE’S LONG LOST FIRST PLAY (abridged) is the literary holy grail: an actual manuscript in Shakespeare’s own hand showing all his most famous characters and familiar speeches in a brand-new story. But because it’s one hundred hours long and contains multiple unwieldy story lines, it was decided, as a public service, to abridge it down to a brief and palatable ninety-minute performance for this lost masterpiece. Something wickedly funny this way comes! An evening of wonderlandian aerial acrobatics. Come find yourself in a world of wonder as you join Alice and the rest of her friends in a magical reimagining of C.S Lewis’ classic tale, by the Majestic Aerial Artists. The troupe has prepared a spectacular evening full of zany, mad characters performing on a variety of aerial apparatuses including the silks, sling, and lyra. We cannot wait to see you there, and remember, we are all mad here in Wonderland! Amir Kapoor is a successful Pakistani-American lawyer who is rapidly moving up the corporate ladder while distancing himself from his cultural roots. Emily, his wife, is white; she's an artist, and her work is influenced by Islamic imagery. When the couple hosts a dinner party, what starts out as a friendly conversation escalates into something far more damaging. An evening with celebrated solo pianist George Winston at the Majestic Theatre in Corvallis, Oregon on Friday, September 13 at 7:30pm and Saturday, September 14 at 7:30pm. Please join us in support of a local food bank by bringing a donation of canned food to the concert. There will be collection baskets at the entrances. George Winston is undeniably a household name. He’s inspired fans and musicians alike with his singular solo acoustic piano songs for more than 40 years while selling 15 million albums. A tireless road warrior playing nearly 100 concerts annually, live performance for Winston is akin to breathing. Winston’s music is evocative, offering us all a chance to take a step back from our perpetually busy lives and let our minds adventurously wander. Restless Wind is a portrayal of Winston’s place in a chaotic world – his compositions extend solace with an idiosyncratic grace. A $2 processing fee will be added to all tickets purchased online. To avoid this, purchase tickets at the Majestic Box Office in person or by phone 541-738-7469. Box Office Hours: Wed-Fri 12:00pm-5:00pm or 60 minutes before any showtime. Starker Auditorium is our Majestic Main Stage! Gift Certificates now available for purchase at the box office in any denomination! Box Office Hours: 12:00pm - 5:00pm, Wednesday - Friday during periods of active production. The Box Office is also open 60 minutes before all performances.